A playpen is a safe place to put your baby when you are doing some important things. As babies grow bigger, they need an enjoyable place to stay and play with their favorite toys. When babies start to crawl, you should ensure that they never bump into hard corners of your house or never leave them wandering into the room unsupervised. 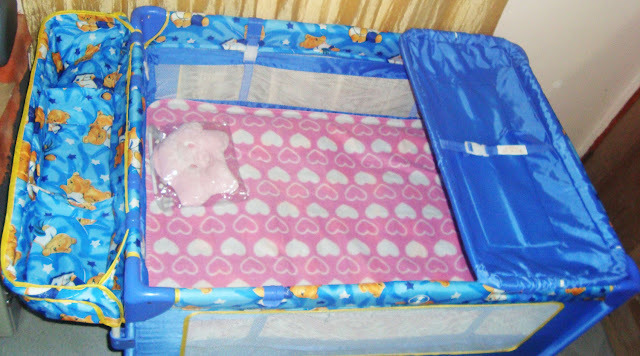 Safety is important for our babies and therefore at some point, a playpen can be really useful. Buying a playpen is actually on our list but we have decided to wait for the baby to learn how to sit or crawl before buying one. Luckily, we found a sponsor for our baby girl's play pen! My hubby's brother and his wife gave us a beautiful blue playpen. We agreed with the color so we can still use it if ever the next baby would be a boy (and that would be more years from now). * Do not put too much things inside the playpen such us toys and blankets until the baby can sit or stand to avoid suffocation. * And also do not leave your baby inside the playpen unattended.